Anika and Gauri meet. Gauri says that this house is so good. Anika cries and tells that she is missing everybody. Gauri says how you maintained everything so finely. Anika says I am going to be a perfect housewife from now. Gauri asks about that room. Anika gets scared and then says it’s not important and we should go now. Anika remembers everything that happened. Rudy also comes there. He also tries to open that. A lady in black saree takes out the gun on another side of the door. Anika becomes scared and Gauri notices her. She asks what happened. They all discuss the matter. 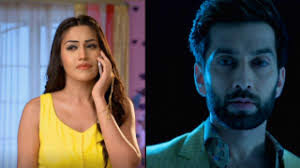 Shivay says if Anika is saying then there is something for sure. He says I have installed CCTV camera everywhere. Rudy also says we will protect Anika. Gauri says yes true we will kill that lady. Omkara says you have a plan. Gauri says yes I have made a plan already and we will do something to make that lady leave the house. Gauri asks Anika to sleep. Everyone connects with each other through Bluetooth. Gauri asks Anika to go out. Anika sees that lady in black saree and everyone catches her. They ask who is she. Police come and recognizes her as Julie. Police take her and say she is the biggest thief in this area. Rudy says let’s do party. Next day everything gets ready. Anika praises Shivay of being so good and planning a perfect party. Veer and his wife come to the party. Tez asks for Om. Pinky says they are tired of you that’s why left. Tez says enough is enough. Shakti says you also are not doing good. Tez asks Janvi to call Rudra. Dadi comes and says I am leaving this house. Everyone gets shocked. Tez says why. Dadi cries and tells that there is no reason to stay and Om, Rudra, Gauri left home and went to Shivay’s house.